A link to "Business Wireless Gateway overview" will be sent via email. Your link to 'Business Wireless Gateway overview' has been sent! The BWG consolidates the equipment used to provide Business Internet and WiFi access from four separate devices down to only one device. You can order the Business Wireless Gateway and will have the option to disable the Private WiFi network or the XFINITY® WiFi hotspot network. Download a copy of the Business Wireless Gateway Quick Start Guide (Adobe Reader required) or read on for more information. The Business Wireless Gateway produces two wireless signals for the Private WiFi network by default – a 2.4 GHz network and a 5 GHz network. The 2.4 GHz network provides a further-reaching WiFi signal but can have difficulty passing through materials which can limit WiFi coverage. The 5 GHz network provides a WiFi signal that does not reach as far as the 2.4 GHz network but is able to pass through materials better which can help provide better WiFi coverage in those scenarios. It is recommended that you connect to both the 2.4 and 5 GHz networks for the best experience if possible. If your device only supports the 2.4 GHz network, you will be unable to connect to the 5 GHz network. Not all WiFi devices support 5 GHz, especially older ones. If a device is 5 GHz capable, you should see the 5 GHz Network Name (SSID) in the list of available networks on their device. If the SSID is not listed or if you are unsure if your device supports 5 GHz WiFi, check the device manufacturer’s documentation. Although the Business Wireless Gateway simultaneously broadcasts both 2.4 and 5 GHz, WiFi devices can connect to only one WiFi network at a time. 5 GHz WiFi signals may not travel as far as 2.4 GHz. In areas of your business that are furthest away from the Business Wireless Gateway, only the 2.4 GHz network may be available. 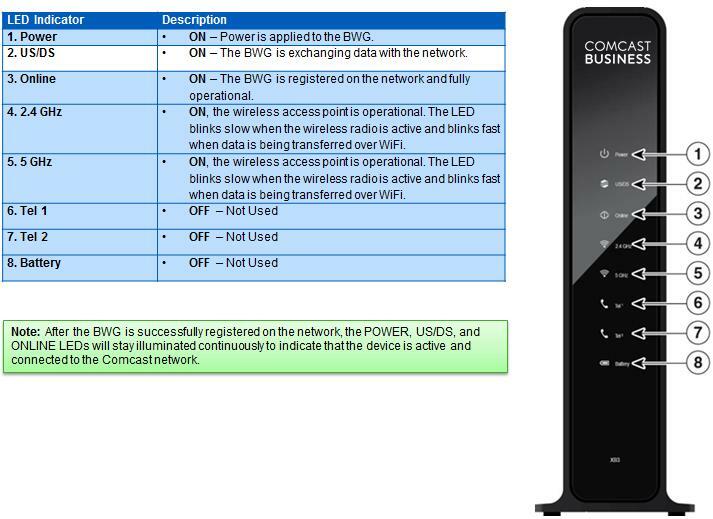 Devices connected to the Business Wireless Gateway's 5 GHz network that move out of the 5 GHz range may automatically switch to the 2.4 GHz connection that reaches further than the 5 GHz network. You may need to manually switch back to the 5 GHz network to reconnect and experience the benefits of the 5 GHz network. Compatible with many newer 5 GHz WiFi electronic devices, such as tablets, mobile phones, laptops, HDTVs, etc. Business Private WiFi is provided to you via the secondary satellite access point(s). 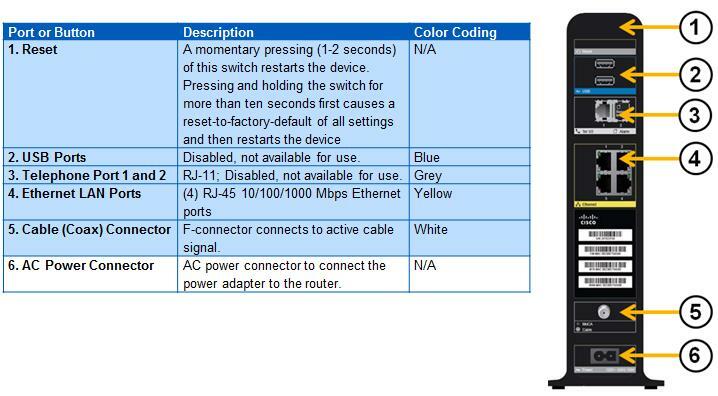 The Business Wireless Gateway is used as the Internet servicing gateway, but does not serve as the Private WiFi access point and should have the Private WiFi broadcast turned off or deferring to the secondary access point(s). Your business network administrator can customize the Private WiFi network name via the Business WiFi Pro section in Comcast Business My Account. The Private WiFi network uses both the 2.4GHz and 5GHz frequencies by default. Business Guest WiFi is provided to you via the secondary satellite access point(s). 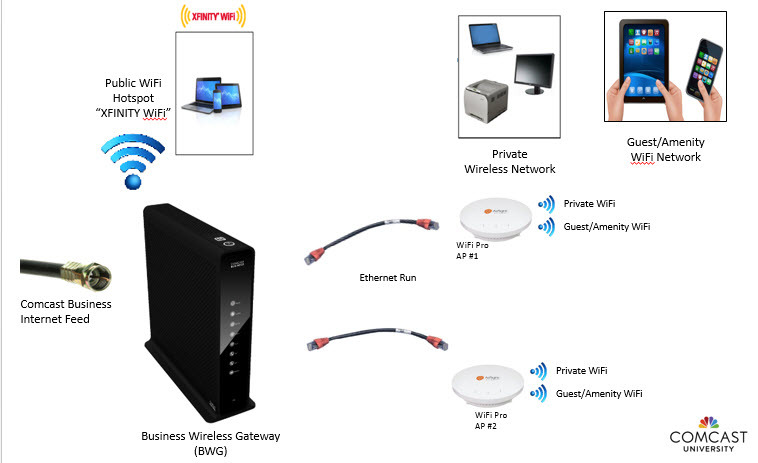 The Business Wireless Gateway is used as the Internet servicing gateway, but does not serve as the Guest WiFi access point and defers to the secondary access point(s) to provide the Guest WiFi network. The Guest WiFi network is open to both Comcast and non-Comcast customers. The Guest WiFi network broadcasts an open (no password) SSID by default at time of install. A default SSID for Guest WiFi will be pre-configured for the secondary access point, but the install technician works with you to determine a new Guest WiFi network name (business-specific naming, like ‘Joe’s Pizza Guest - Free WiFi’). Your business network administrator can also customize the Guest WiFi network name via the Business WiFi Pro section of My Account. The Guest WiFi network uses both the 2.4GHz and 5GHz frequencies by default. The XFINITY® WiFi network uses both the 2.4GHz and 5GHz frequencies by default. Business Wireless Gateway provides access to the Internet from any location within range of the Wireless Access Point (WAP).